It’s been exactly two years since I last wrote about a camera on this blog. A lot has changed in the camera scene over the last two years and I fell in and out of love with the NEX-5 during this time as well. In this post I shall begin with talking about the recent trends in the camera market followed by short reviews of a few new generation cameras that I have tried or bought. The hot new stuff these days undoubtedly is the rise of “mirrorless” or “EVIL” (Electronic Viewfinder Interchangeable Lens) cameras. “Mirrorless” is a broader term that just indicates the absence of a mirror that is traditionally used to operate the Auto-focus system in SLR cameras. Mirrorless cameras use their sensors directly to auto-focus either through contrast detection (CDAF) or phase detection AF sensors embedded directly on the main sensor. Mirrorless cameras may not have a viewfinder or allow changing of lenses. EVIL cameras include both. By discarding the mirror, the bodies of these cameras can be considerably thin. By dropping out the optical viewfinder, these bodies also save space otherwise occupied by the pentaprism in SLRs. This opportunity in body size reduction for the same sensor size is the main selling point of the mirrorless cameras. They allow you to carry cameras capable of seriously good IQ in a smaller package. As the Sony NEX system demonstrates, while it’s possible to reduce the body size considerably by going the mirrorless route, the size of the lenses does not reduce since it’s largely related to sensor size. To reduce the overall size of the package, the sensor size must also be reduced. Traditionally, small sensors have had a big gap up to the IQ delivered by bigger ones (APS-C/APS). However, smaller sensors have also now reached the IQ sweet spot where minor improvements in IQ are harder to perceive and more expensive to deliver. A striking example of this is the 1 inch sensor inside Sony Cybershot DSC-RX100. 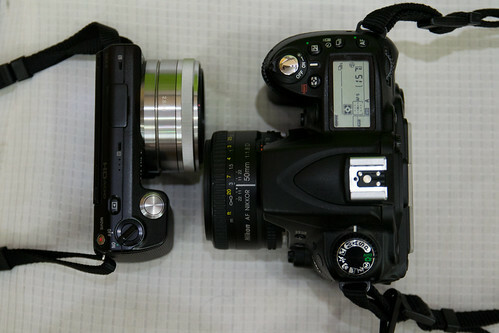 As per DXOMark, this sensor is better than that of the Nikon D80, despite being 3.24x smaller. It even matches up to the D90 in all except low light performance! This isn’t to mean that the large sensors haven’t improved in the mean time. However, the IQ delivered by small sensor systems is now enough to make fairly large (8×12″ or 12×18″) prints without noticing defects. That really is more than most non-professional photographers would want out of their camera. To summarize, digital cameras are now in a phase of miniaturisation as they have reached and exceeded the levels of “acceptable” performance. Miniaturisation is enabled mainly by getting rid of the mirror and pentaprism assembly from traditional SLRs and having their functions performed by the camera electronics (CDAF, Electronic Viewfinder). Systems with smaller than APS-C sensors also benefit from a significant reduction in the size and cost of lenses. The resulting cameras are not only physically smaller, but they are also cheaper than their large-sensor counterparts when you include the cost of lenses. In the next part of this post, I shall write about a few recent cameras that are at the forefront of this miniaturisation and see how they compare to DSLRs.